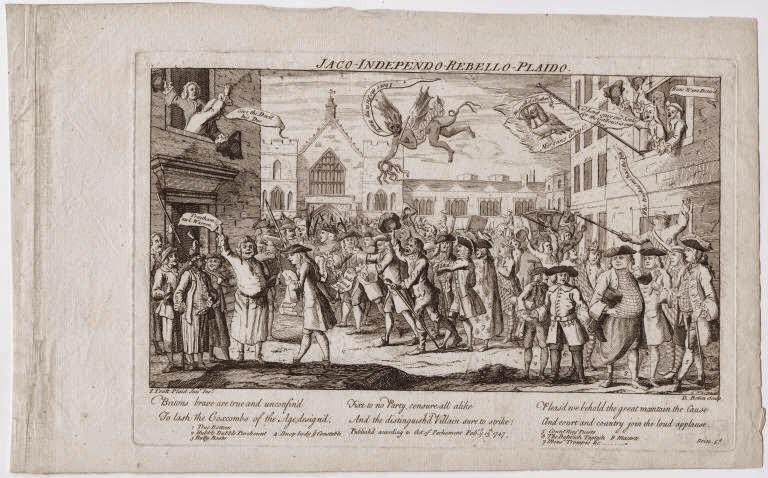 Jaco-Independo-Rebello-Plaido, D. Bobin, 1747, Yale University Walpole Library. There are many things you can say about political cartoons of the eighteenth century. What you can't say is that they were subtle. Half a year after the crushing defeat of the Jacobite rebellion at Culloden, this cartoonist still fears sedition from the North. Or, more appropriately from Satan. The kilt-clad Devil himself floats above the mob, grinning at their dissent. 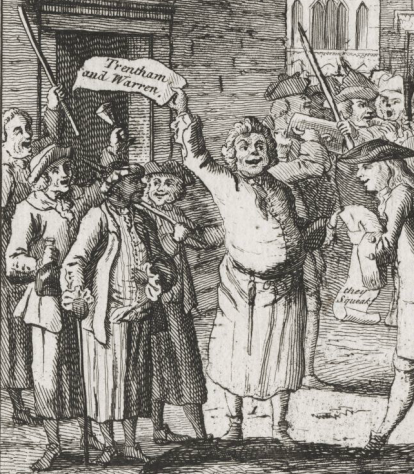 Any self-respecting eighteenth century mob must include sailors. This one is no different, and they can be found in the far left foreground. Most of the tarpawlins wear short jackets with buttoned mariner's cuffs and slops. The headware is diverse: one is hatless, another with a round hat, a third with a cocked hat, and at the center: a turban! A "Turk" has joined the sailors, as evidenced by his dark skin, mustache, and turban. The North African sailor is by far the best turned out of the lot, with striped waistcoat and slops as well as frilled cuffs. He, along with his mates, bears a cane or walking stick. At first glance, it looks like a belaying pin. 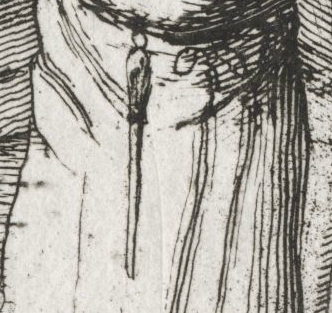 Today, it's a popular "reenactorism" for interpreters to stuff a belaying pin in their belt to use as a bludgeon. In the roughly two hundred images I have examined so far, this would be the first to evidence that. Canes, sticks, and cudgels are far, far more popular than belaying pins ashore. At that, there's an odd loop to the top of it. Belaying pins require no loop or hook, as they fit into precut holes in the fife rail of a ship. More likely, this piece is a marlinspike, fid, or other sailor's instrument. UPDATE: At the suggestion of a few of my loyal readers, and the examination of other images, it is clear that this man is not a sailor. Rather, he is a butcher! The tool at his waist is used to sharpen his knives. By God, I think you may be right! It never even occured to me that he could be the cook. I thought it looks like a sharpening steel.